Sen. Obama's statement announcing the formation of an exploratory committee appeared as a 3 min. 7 sec. 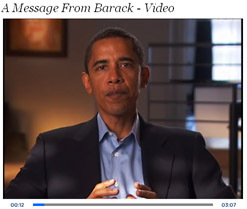 video on the Obama Exploratory Committee website. I certainly didn't expect to find myself in this position a year ago. But as I've spoken to many of you in my travels across the states these past months, as I've read your emails and read your letters, I've been struck by how hungry we all are for a different kind of politics. So I've spent some time thinking about how I could best advance the cause of change and progress that we so desperately need. The decisions that have been made in Washington these past six years, and the problems that have been ignored, have put our country in a precarious place. Our economy is changing rapidly, and that means profound changes for working people. Many of you have shared with me your stories about skyrocketing health care bills, the pensions you've lost and your struggles to pay for college for your kids. Our continued dependence on oil has put our security and our very planet at risk. And we're still mired in a tragic and costly war that should have never been waged. But challenging as they are, it's not the magnitude of our problems that concerns me the most. It's the smallness of our politics. America's faced big problems before. But today, our leaders in Washington seem incapable of working together in a practical, common sense way. Politics has become so bitter and partisan, so gummed up by money and influence, that we can't tackle the big problems that demand solutions. We have to change our politics, and come together around our common interests and concerns as Americans. This won't happen by itself. A change in our politics can only come from you; from people across our country who believe there's a better way and are willing to work for it. And that's why I wanted to tell you first that I'll be filing papers today to create a presidential exploratory committee. For the next several weeks, I am going to talk with people from around the country, listening and learning more about the challenges we face as a nation, the opportunities that lie before us, and the role that a presidential campaign might play in bringing our country together. And on February 10th, at the end of these discussions and in my home state of Illinois, I'll share my plans with my friends, neighbors and fellow Americans. In the meantime, I want to thank all of you for your time, your suggestions, your encouragement and your prayers. And I look forward to continuing our conversation in the weeks and months to come.